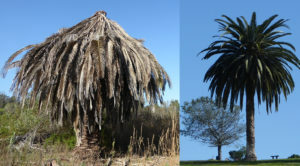 ISCA Technologies, a Riverside biotech company, and the University of California, Riverside (UCR) scientists will work to develop environmentally-friendly pest controls to save California’s iconic palm trees and protect the date palm industry from the invasive South American palm weevil. The Foundation for Food and Agriculture Research (FFAR), a nonprofit established in the 2014 Farm Bill with bipartisan congressional support, on Wednesday, Nov. 1, awarded $150,000 to fund research to combat this emerging pest. The FFAR grant is being matched by funds from UCR, ISCA, California Date Commission, and the Bard Valley Medjool Date Growers Association, for a total $300,000 investment in addressing this pest. The South American palm weevil first spread from Mexico’s Tijuana area into San Diego County in 2011, where it is now killing Canary Island date palm trees. Surveys also have detected the weevil in California’s Imperial County, as well as in the Yuma, Ariz., and Alamo, Texas counties.At risk are several palm species, including commercial date trees that contribute about $89 million a year to California’s and Arizona’s economies. Other at-risk palms include Canary Islands date, coconut, African oil, sago and California fan palms. The national market for landscape, decorative and potted palm trees is valued at more than $280 million a year. The collaboration between ISCA Technologies and UCR’s Center for Invasive Species Research was developed to stop the spread of the weevil species from Mexico and to eradicate it in the United States. “The behavior of this weevil is modulated by a precise set of naturally occurring compounds called semiochemicals, and we believe that this is its Achilles heel. We will create semiochemical formulations to monitor and control populations of this invasive species in an effective, economical and environmentally-friendly manner,” said Agenor Mafra-Neto, the CEO and founder of ISCA Technologies. “This funding has arrived a critical time. We need to get ahead of the weevil invasion in San Diego and this support provides the boost we need,” said Mark Hoddle, director of the UCR’s Center for Invasive Species Research. Canary Islands date palm in San Diego County, Calif.
South American palm weevils are formidable pests. They measure about 2 inches, and use their stiff, protruding stouts, called rostrums, to bore holes in leaf bases in the crowns of palm trees. Females lay their eggs in these holes and seal them off with wax. After the eggs hatch, the larvae feed on the nutritious plant tissue of forming leaves in the crown for two months. Just 30 larvae can consume enough tissue to kill a tree. Beyond the physical damage that the South American palm weevil causes, the weevils also carry the red ring nematode, a tiny parasite that causes fatal red ring disease in palm trees, making every infestation potentially deadly. The red ring nematode, or roundworm, has yet to be found in the United States. ISCA and UCR will collaborate to develop and field test formulations with naturally occurring compounds, called semiochemicals, to modify the behavior of adult weevils. One formulation will attract the targeted weevils to small but lethal doses of a pesticide. The mix will be applied to trees in silver dollar-sized dollops, using a paste made mostly of food grade oils and waxes. By attracting the bug to the pesticide, this technology uses less than a hundredth of the volume of pesticide used by traditional spray applications. The collaborators also will further develop and test in San Diego County a weevil repellant based on a different mix of semiochemicals and deployed in the form of a paste. Preliminary work in Brazil has shown that this blend elicits strong repellency on South American palm weevils. The UCR-ISCA effort will further test and evaluate use of drones to identify weevil infestations over large swaths of land, so new outbreaks can be identified and treated before they expand. The grant is issued through FFAR’s Rapid Outcomes from Agricultural Research (ROAR) program, an initiative designed to prevent and mitigate damage from emerging pests and pathogens through short-term research funding. Applicants are encouraged to form broad-based coalitions to increase research collaboration and maximize the mitigation potential of each grant. ISCA Technologies is a biotech company based in Riverside, Calif., that develops, tests and commercializes safe, economical and environmentally-friendly integrated management solutions to crop-destroying and disease-spreading pests worldwide based on the use of naturally occurring compounds that influence animal behavior. Center for Invasive Species Research at UCR provides a forward-looking approach to managing invasions in California by exotic pests and diseases through early detection, the rapid development of control or eradication measures, and improved Integrated Pest Management practice, among several other strategies.